Ladies! Gok Wan is back by popular demand across Ireland. A superb girls’ day out for everyone, and an amazing Mother's Day gift. 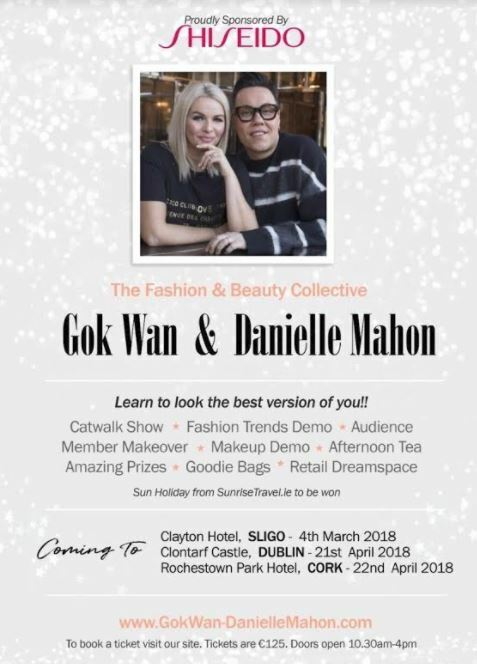 This time round Gok is teaming with one of Ireland's leading and award-winning makeup artists, Danielle Mahon, and they are set to bring you the ultimate Fashion and Beauty Collective. Visiting the Clayton Hotel Sligo on the 4th March, Clontarf Castle Dublin 21st April, Rochestown Park Cork 22nd April, these very special events will be packed full of their expert tips, demos, catwalk shows, a delicious afternoon tea, amazing prizes PLUS one lucky audience member will be picked out by the man himself for a very special Gok Wan/Danielle Mahon Makeover on the day! Everyone leaves with a Luxury Goody bag worth over €100 from Shiseido, Sleek Makeup, NIMA brushes, 7th Heaven, Moroccan Oil, and super spot prizes on the day. You will also get a group photo with Gok Wan and Danielle Mahon for a special souvenir of this sensational day! In even more exciting news, we have a pair of tickets to give away to the Clontarf Castle, Dublin Fashion & Beauty Collective on April 21st. To win, just enter below! Winner picked on Thursday, March 8th. Otherwise, tickets are €125; buy them here www.gokwan-daniellemahon.com.